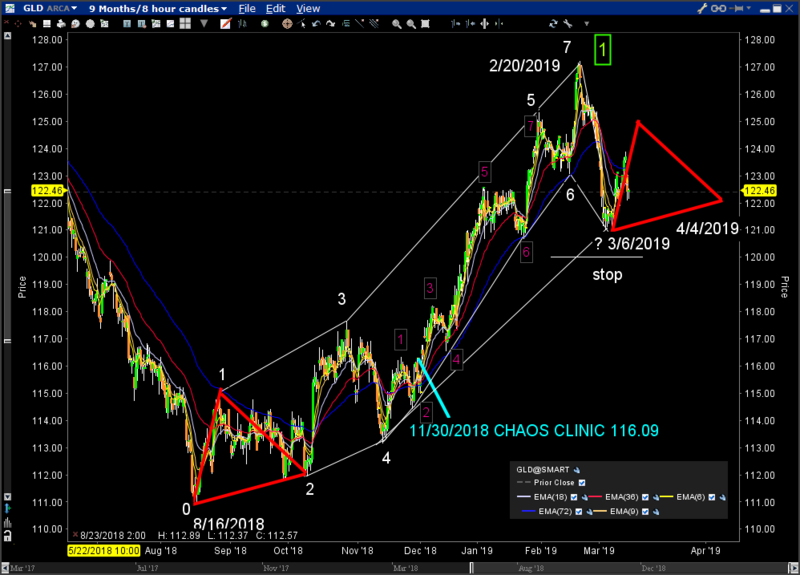 Clinic, it has completed the forecast 7 moves in an Up Chaos Clamshell. Up Chaos Clamshell itself. This is shown by the red boxed numbers 1-7.
the largest and fastest and best to trade. The moves 6 and 7 were quick, with move 7 being an obvious blow off. From there prices dropped sharply into March 6th. So what now? The most likely pattern is a consolidation, before further advance. a much larger Chaos Clamshell. This is shown by the green boxed number 1.
might look like the August through October 2018 move, outlined as a red triangle. congest until about April 4th. near the end of the triangle. Purchases can be protected with a stop at 120. 3/15/2019 1:56:47 PM MT gg:: It did it - went below 2826 Yellow Horizontal line on Secret. That chart wasn't up last I checked, but still it's for sure below it now. 3/15/2019 1:35:51 PM MT gg:: Will it did below 2826 Yellow Horizontal line on Secrete. My guess is yes. 3/15/2019 1:34:03 PM MT gg:: Chaos chart approaching 2nd vertical blue line. 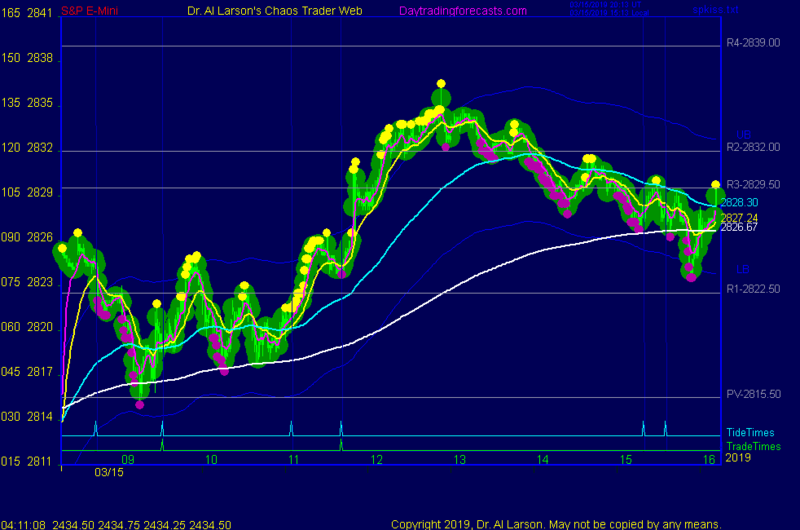 Also, could it break downward with vertical red tide line? 3/15/2019 12:36:12 PM MT gg:: Lower High forming? 3/15/2019 10:26:51 AM MT ghb****:: RR have you studied the list of charts page for the trading moon tides tutorial? 3/15/2019 10:18:36 AM MT RR:: Dr. Al, In SPKISS, do you follow red or green tide? 3/15/2019 9:24:22 AM MT gon:: All right. Besides we have similar patterns in Yen-quoted cross currency pairs (like USDJPY, NZDJPY, etc.) negating this marginal higher high in the blue chips. 3/15/2019 9:00:02 AM MT gon:: Good morning! The broader indices as well as international ones are conforming the bigger topping pattern we discussed last week. Does it conflict when, like in this case, the SP500 and Nasdaq have made higher highs? 3/15/2019 7:30:27 AM MT RR:: Dr. Al, what would be the signal @9:32, a buy or sell? 3/15/2019 7:26:22 AM MT RR:: Dr.Al, where is the chart for Mercury/Moon cycle? 3/15/2019 7:11:43 AM MT Al****:: the down turn came on a Mercury/Moon cycle. 3/15/2019 6:25:41 AM MT jvj****:: Good Morning Everyone! Chaos Clinic is posted on the AUX page. Today is Quad Witching Day, when 4 different option dates expire at once. These days are often dull.